John Ford's classic western will round up Blu-ray in February. 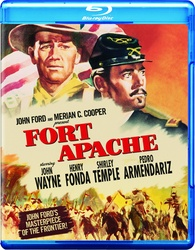 In an early announcement to retailers, Warner Brothers says 'Fort Apache' starring John Wayne, Henry Fonda, and Shirley Temple will be released on Blu-ray on February 21. You can find the latest specs for 'Fort Apache' linked from our Blu-ray Release Schedule, where it's indexed under February 21.